After years of planning and research, we're excited to announce that our Board of Directors has approved our Building on Excellence two-phased construction project. We broke ground this spring on Phase One with a new Athletic Center currently under construction on our campus (current construction photo to the left). We are also renovating the Elementary and 6th Grade Building during Phase One to support learning in the twenty-first century. Both projects are scheduled for completion in early 2019. Updates and details about what construction will mean to you and your family will be shared as available. Click on the tabs below to check out details and renderings for each project. This is an exciting time for our school! We will need support from the entire DA community to ensure successful completion of these projects. We look forward to the launch of our 50th Anniversary campaign next fall and can't wait to have you involved! The time has come to renovate the Elementary/6th Grade Education Building. Our plan is to transform an environment that was originally created as a dormitory into a space that supports learning in the 21st century. Our faculty is trained to use spaces effectively and innovatively to facilitate learning and differentiate instruction. A key to our model is leveraging the learning profiles and strengths of each student. This new space will help facilitate our approach, providing an environment that is conducive to collaboration, movement, flexibility, technology, and concentration. Our new design will increase classroom sizes from less than 400 square feet to approximately 650 square feet. We will have multi-use functionality where flexible spaces can be transformed into different arrangements depending on the lesson. The renovated building will be designed with technology in mind and will have dedicated space for teacher collaboration and storage. The benefits of athletics, health, and wellness are no secret, and the connection between healthy bodies and healthy minds is strong. Through sports and fitness training, students have opportunities to develop teamwork, self-discipline, confidence, and character. Given the age, design and space limitations of the current gymnasium, a new athletic center is needed to support and strengthen our athletics, health, and wellness programs. The new 25,000 square foot facility will have a regulation, varsity-sized, multi-use gym complete with 500 seats. We will have a room for training and fitness, a multipurpose/wrestling room, and a yoga/dance studio. The new design allows for classroom space and locker rooms for our athletes and visiting teams. 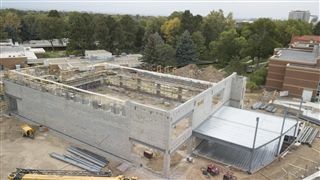 As we approach our 50th anniversary, for the first time on our campus, we will have a place large enough for our entire community to convene in the new Athletic Center. Additionally, DA will have a facility that is equipped to host district and regional tournaments, something we have not been able to do in the past. Contact Senior Project Manager with JHL Constructors, Inc., Jeff Johnson, CHC. Contact Denver Academy Director of Development, Karen Lozow.